Ahhh ~ Who doesn’t remember s’mores from their childhood? The treat goes back generations and continues to be a favorite with all ages. It is believed that s’mores began with campfire girls and spread from there. The recipe was first published in a Girl Scout handbook in 1927. Why the name? Urban legend or not, it is said that once someone first tasted a warm and gooey s’more–it was difficult not to say, “Give me some more!” Hence the early campfire treat became known as s’mores! 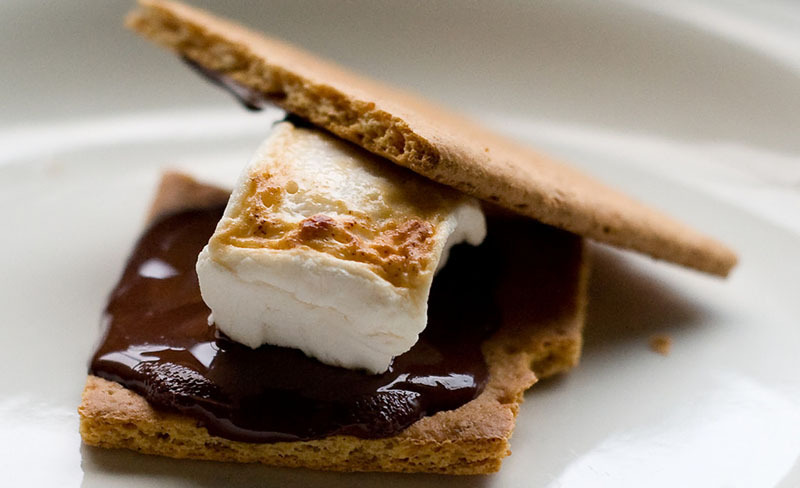 The basic s’more idea has crept into recipes with versions of cookies, cupcakes and candy! There are many ways to make them and none of them are wrong… “Your way” is the right way! Enjoy! 1. Prepare ingredients… Break large graham crackers in half. This will be the base and top for the s’mores. Unwrap candy bars and break into pieces to fit the graham cracker squares. Place the chocolate on the crackers. 3. Place roasted marshmallows on cracker halves with chocolate. Place a plain graham cracker on top of this. 4. Squish down a bit and let the warm marshmallow melt the chocolate a bit. Mmmmm–give me s’more! 1. Plate a large marshmallow onto a Graham Cracker Square. 2. Microwave IT on high for 10 to 12 seconds or until the marshmallows puffs in size. 3, Remove from microwave and top with chocolate square that has previously been broken to fit the cracker. 4. Top with another cracker square–sandwiching the filling. 5. Turn over so the graham cracker chocolate part is facing downward. Squish together until marshmallow oozes out a bit and chocolate begins to melt! Ingredients: 1 graham cracker and 1 Tablespoon chocolate frosting. Break each cracker into four sections and spread frosting on two. Place the other two crackers on top to make sandwiches. Use Marshmallow Fluff! TAKE chocolate-covered grahams and spread them with Marshmallow Fluff for easy, no-bake S’Mores! …Spread Peanut butter onto saltine crackers. …Place a marshmallow on top of peanut butter. …Place in toaster oven until marshmallow is golden brown. S’MORES and PEANUT BUTTER TOO! Spread peanut butter with knife on 1 graham cracker square. Top the peanut butter with the chocolate bar. Spread the marshmallow creme on the remaining graham cracker square; place it marshamallow side down on the chocolate bar. PLACE 1 Turtle on 1 graham cracker square. Top with 1 marshmallow half. MICROWAVE on HIGH (100%) power for 10 to 15 seconds or until marshmallow expands. Immediately top with 1 graham cracker square. Repeat with remaining Turtle, graham cracker squares and marshmallow half. Looking for a fun treat to make with the kids that involves absolutely NO cooking or baking? These yummies are perfect for hot summer days! In a large bowl with a wooden spoon, stir together first three ingredients. Mix well. Scoop mixture onto a graham cracker square and sandwich with another square. Continue making S’Mores and place them in the freezer for approximately 1 1/2 hours, or until frozen. Serve frozen. In small microwavable bowl, microwave chocolate chips and condensed milk on High 1 to 2 minutes, stirring occasionally, until chips are melted. Stir to mix well. Pour into 9-inch glass pie pan, spreading evenly. Drop marshmallow creme by tablespoonfuls randomly over chocolate mixture. Microwave on High about 30 seconds or until marshmallow creme is softened. Immediately with knife, make several small swirls through marshmallow and chocolate, creating a marbled appearance. Have children place one graham cracker sheet in a foil pie plate. Sprinkle with chocolate chips, and miniature marshmallows. Cover the pie plate with tin foil, and label tins for each child. Place outside in a sunny hot place, check after 20 minutes. They are done when the sun has melted the chocolate and marshmallow. Yummy! You need to do this experiment when it is at least 85° F. If it isn’t hot enough outside, wait for a warmer day. 1. Cut KELLOGG’S POP-TARTS FROSTED S’MORES toaster pastries in half. Spread marshmallow creme on top of pastry pieces. Arrange sprinkles on top, if desired. Place on baking sheet. 2. Broil 5- to 6-inches from heat for 2 to 4 minutes or until lightly browned. Serve warm. 1. Line a greased 9×13″ baking pan/dish with graham cracker pieces. 2. Following package directions, prepare brownie mix. Pour the mixture over the graham crackers. 3. Bake for 25 minutes in a preheated 350 degree oven. 4. Remove after 25 minutes and scatter chocolate chips, marshmallows, and nuts evenly over top of brownies. 2. Spray a 13×9 inch baking pan with no-stick cooking spray. Cut pound cake into 15 slices. Place in the bottom of a the pan–cutting to fit cake if needed. 3. Sprinkle marshmallows, chips and peanuts evenly over pound cake. 4. Bake for 8-10 minutes or until marshmallows are melted and lightly toasted. Cool;cut into squares. Makes 24 servings of one square each. Did you know that each year National S’Mores Day is August 10th? Be sure and celebrate this fun day!